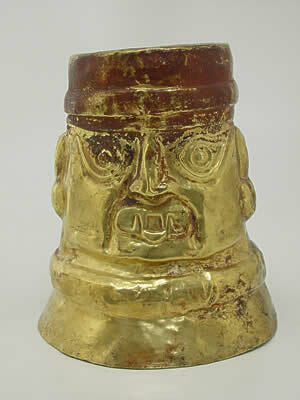 Gold kero (ceremonial cup), Lambayeque, c. 700 AC. Photo: Museo Larco, Lima, Peru. Luxury Peru Travel & Peru Tours. An integral part of the cultural experience is regional cookery and its nouvelle interpretations. Every day, savor gourmet cuisine by the great chefs of South America. All meals and any needed transportation are included. Dinner is at 8 pm, unless you request otherwise at the time of booking your tour. Details vary by country. In Peru, Ecuador and Chile, order à la carte from each restaurant's complete menu, including unlimited beverages sold by the individual serving. In other countries, choose an appetizer, entree, dessert and beverages from the table d'hôte menu. If you find table d'hôte menus too limiting, we will reduce the tour price by $50 per meal. You will order à la carte and pay the restaurant directly. If you prefer this option, kindly request it at the time of booking your tour. In the Andes, drinking plenty of water is recommended to alleviate altitude sickness. We provide a bottle of water with your morning excursion, lunch and your afternoon excursion. A buffet or American breakfast is served in your hotel each morning. A gourmet lunch of traditional or nouvelle Andean cuisine including beverages is provided each afternoon. Your guide will join you unless you request otherwise when booking your tour. Lima: On the first day, a lunch at the Café del Museo, located in the gardens of the Museo Larco and directed by Peru's most prestigious chef, Gastón Acurio. On the last day of your tour, if you are returning home from Lima, a lunch by chef Rafael Osterling at Rafael. Sacred Valley: On the first day, a lunch by chef Ricardo Behar at 3 Keros. On the second day, a lunch by chef Pio Vazquez de Velasco Jimenez in the patio of El Huacatay, a country restaurant with big-city sophistication. Indeed, chef Pio is making a name for himself throughout Peru after mastering his skills in the kitchen of Lima's Astrid & Gaston. El Huacatay and 3 Keros fight for the title of the best restaurant in the Sacred Valley. Machu Picchu: On the first day, a sumptuous buffet luncheon by resident chef Gumercindo Cáceres at the Sanctuary Lodge's Tinkuy Restaurant. On the second day, a lunch by executive chef Rafael Pérez Cambana and head cook Iván Chávez at the Café Inkaterra. Cuzco: On the first day, a lunch by chef Rodolfo Rolando in the patio of Pacha Papa; and on the second day, a lunch by chef Coque Ossio at Limo. Orient-Express Andean Explorer: A three-course lunch directed by Mariano Takinami, executive chef of Orient-Express in Peru, followed by coffee in the glass-walled observation car. Lake Titicaca: Each day, a lunch by head cook Glicerio Cruz at the Titilaka. Arequipa & Colca Canyon: In Arequipa, a lunch at La Trattoria del Monasterio, directed by chef Gastón Acurio. On the first day in the Colca Canyon, a box lunch prepared by resident chef Julio César Valdivia at the the Casa Andina Private Collection Arequipa's Alma. On the second and third days, a lunch by resident chef Celestino Vilca at the Colca Lodge. Quito: Depending on the excursion you choose, a lunch by chef Carlos Alvear at El Crater, inside the Pululahua Volcano, or a table on the Plaza San Francisco with a lunch by chef Juan José Loaiza at Café Tianguez. A gourmet dinner of traditional or nouvelle Andean cuisine including beverages is provided each night. You will dine privately without your guide. Lima: On the first night, a welcome dinner by chefs Gastón Acurio and Astrid Gutsche at Astrid & Gastón, one of the highest notes in the Peruvian culinary scene. On the last night of your tour, if you are returning home from Lima, a farewell dinner by executive chef Javier Morante at the Casa Andina Private Collection Miraflores' Alma. Sacred Valley: Each night a dinner by resident chef Angel Hilares at the Rio Sagrado's El Huerto Restaurant. Machu Picchu: A dinner by executive chef Rafael Pérez Cambana and resident chef David Damian Díaz in the dining room of the Inkaterra Machu Picchu. Upon your return to Cuzco, a dinner by executive chef Mariano Takinami at the Monasterio's Restaurante El Tupay. It is the city's most refined dining establishment. Cuzco: On the first night, a dinner by chef Manuel Cordova at the MAP Café, in the courtyard of the Museo de Arte Precolombino; and on the second night, a dinner at Chicha, directed by Peruvian celebrity chef Gastón Acurio. Lake Titicaca: Each night, a dinner by head cook Glicerio Cruz at the Titilaka. Arequipa & Colca Canyon: On the first night in Arequipa, a dinner at Chicha, directed by chef Gastón Acurio; and on the last night, a dinner by resident chef Julio César Valdivia in the town's most elegant restaurant -- the Casa Andina Private Collection Arequipa's Alma. Each night in the Colca Canyon, a dinner by resident chef Celestino Vilca at the Colca Lodge. Quito: A dinner by chef Alexander Laud at Zazu on the first night, by chef Fabian Huertas at La Belle Epoque on the second and at the Quito locale of Astrid & Gastón, directed by chef Gastón Acurio, on the third. Notes: Caviar is at additional cost and will be billed directly to you by the restaurant. Beverages do not include bottles of wine. If you prefer bottles of wine, you may select a beverage allowance of $25 per person per meal in lieu of unlimited beverages sold by the individual serving.